One of the organizations that support the Natural Areas Program is called, ironically, “Nature in the City” (NIC). In a recent newsletter, they accused opponents of the NAP “a handful of people” who were “still propagating misinformation.” Before we could respond, we saw this excellent riposte in “Death of a Million Trees.” It’s reprinted below by permission, with minor changes. Certainly, we’re finding a groundswell of opinion against NAP‘s so-called “ecological restoration”, which has actually meant a loss of trees and habitat, a growing use of the strongest pesticides San Francisco permits on city-owned land, and restrictions on public access and use — at a cost of millions of dollars and thousands of volunteer hours that could have better been used elsewhere. This is the “celebrated” program NIC refers to. If you’re interested in NIC’s allegations and the reality – read on! 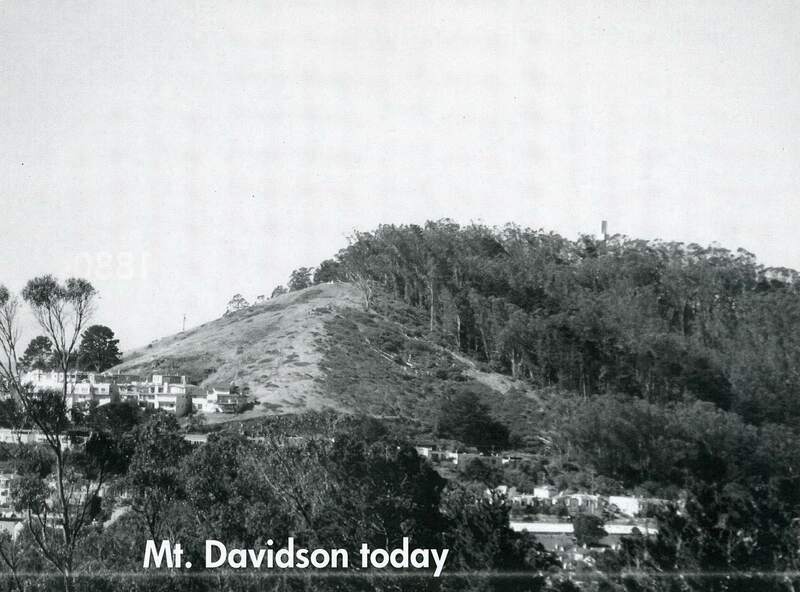 Nature in the City (NIC) is one of many organizations that support native plant “restorations” in San Francisco as well as the principle entity which engages in them, the Natural Areas Program (NAP) of the Recreation and Park Department. Last fall saw the Planning Commission public meeting for the Draft Environmental Impact Report (DEIR) for the Significant Natural Resource Areas Management Plan. Some time later this year, the City will issue a Final Environmental Impact Report, which may be appealed by opponents of the Natural Areas Program. Our objections to the Natural Areas Program have also been reported by three major newspapers in the past month or so (San Francisco Examiner, Wall Street Journal, Sacramento Bee). Many critics of NAP have been engaged in the effort to reduce its destructive and restrictive impacts on our parks for over 10 years. Scores of public meetings and hearings have been held to consider our complaints. We consistently outnumbered public speakers in support of NAP until 2006, when the NAP management plan was finally approved by the Recreation and Park Commission. Although we were outnumbered for the first time, there were over 80 speakers who asked the Recreation and Park Commission to revise NAP’s management plan to reduce its negative impact on our parks. The public comments on the NAP DEIR are the most recent indicator of the relative size of the groups on opposite sides of this issue. These comments were submitted in September and October 2011. We obtained them with a public records request. The Planning Department reported receiving about 400 comments. In analyzing these comments, we chose to disregard about half of them because they were submitted as form letters, even though they were from dog owners who were protesting the loss of their off-leash privileges in the natural areas. We also leave aside the comments from golfers whose only interest is in retaining the golf course at Sharp Park. In other words, we set aside the majority of the comments critical of the NAP management plan in order to focus on those comments that demonstrate a comprehensive understanding of the impact of NAP on the city’s parks. Of the comments remaining, those critical of NAP and its deeply flawed DEIR outnumbered comments in support of the NAP DEIR about 3 to 1. We urge NAP supporters to read these public comments to learn about the wide range of criticisms of NAP, including pesticide use, destruction of trees, recreational access restrictions, loss of wildlife habitat and more. Webmaster: Since the majority of acreage claimed as natural areas by NAP 15 years ago had no native plants in them, there is little truth to the claim that NAP is protecting our “natural heritage.” The so-called “natural area” at Balboa and the Great Highway is typical of the “natural areas.” There is photographic evidence that it was built upon for about 150 years. 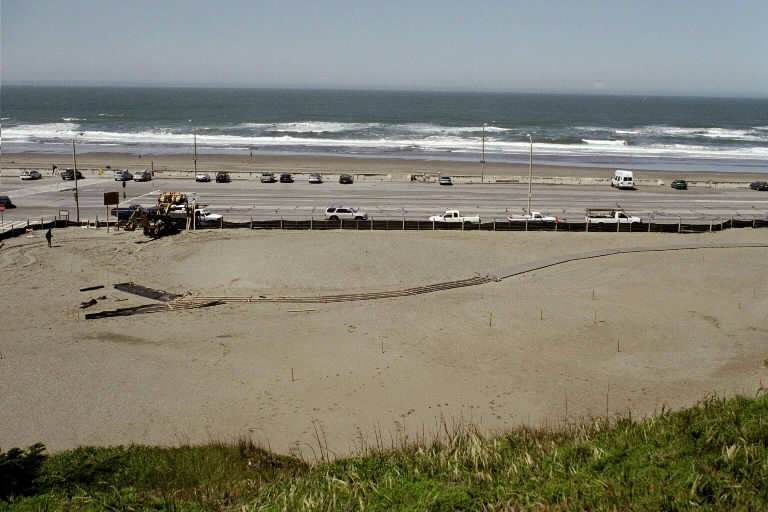 It was the site of Playland by the Beach before it was designated a “natural area.” Sand had to be trucked onto the property and disked down 18” into the construction rubble, then shaped into dunes by bulldozers before native plants could be planted on it. We don’t make any distinction between “native wildlife” and any other wildlife currently living in our city. We value them all. Most are making use of existing vegetation, whether it is native or non-native. They do not benefit from the loss of the blackberries that are their primary food source or the loss of the thickets or trees that are their homes. We do not believe that wildlife in San Francisco benefits from the destructive projects of the Natural Areas Program. 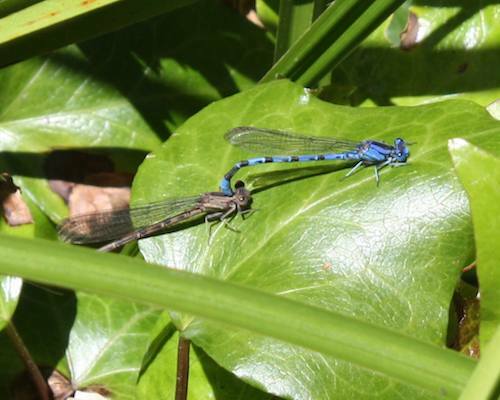 See photos of insects, birds, and other wildlife using non-native plants in the natural areas here. We do not think an ecosystem that has been sprayed with herbicides qualifies as a “healthy ecosystem.” NAP sprayed herbicides at least 86 times in 2011. Their use of herbicides has increased over 330% in the last 4 years. NAP uses herbicides that are classified as more toxic than those most used by other city departments. Last spring, 1,000 visitors to Glen Canyon Park signed a petition, asking the Natural Areas Program to stop using pesticides in their park. This petition was given to Scott Wiener, the Supervisor representing the district in which Glen Canyon Park is located. These are statements of fact that can be easily verified by the public record. Webmaster: Although we value education, we do not consider the staff of NAP and/or its supporters qualified to provide it. We hear them make statements that are demonstrably not true, such as “grassland stores more carbon than trees.” We see them spray herbicides in the dead of winter that are supposed to be sprayed in the spring when the plants are actively growing. We watch them plant things where they won’t grow, such as sun-loving plants in deep shade and plants in watersheds where they will soon be drowned by seasonal rains. And we also have had bad experiences with the volunteers who are called “stewards” by NAP, but sometimes act more like vandals. We see them spraying herbicides that they aren’t authorized to use. We see them hacking away at trees that haven’t been designated for removal. NAP is not providing the necessary guidance and supervision to the volunteers many of whom seem to consider themselves the de facto owners of the parks. “Approximately 80 percent of the SFRPD off-leash acreage is located within Natural Areas.” (page 5-8). The NAP DEIR proposes to close or reduce the size of several off-leash areas. The DEIR provides no evidence that these areas have been negatively impacted by dogs. It also states that all off-leash areas in the natural areas are subject to closure in the future if it is considered necessary to protect native plants. Since NAP has offered no evidence that the proposed immediate closures are necessary, one reasonably assumes it will offer no evidence if it chooses to close the remainder of the 80% of all off-leash areas in San Francisco located in natural areas. We know from the DEIR public comments that NAP supporters demand their closure. “Public use in all Natural Areas, unless otherwise specified, should encourage on-trail use… Additionally, interpretive and park signs should be installed or modified as appropriate to include “Please Stay on Trails” with information about why on-trail use is required.” (page 5-14) In other words, the only form of recreation allowed in the natural areas is walking on a trail. Throwing a ball or frisbee, having a picnic on the grass, flying a kite, climbing the rocks are all prohibited activities in the natural areas. And in some parks, bicycles have been prohibited on the trails by NAP. “Finally, this plan recommends re-routing or closing 10.3 miles of trail (approximately 26 percent of total existing trails).” (page 5-14) So, the only thing visitors are allowed to do in a natural area is walk on the trails and 26% of all the trails in the natural areas will be closed to the public. Webmaster: Destroying non-native plants and trees does not restore indigenous plants and wildlife. Native plants do not magically emerge when non-native plants and trees are destroyed. Planting indigenous plants might restore them to a location if they are intensively gardened to sustain them. However, in the past 15 years we have seen little evidence that NAP is able to create and sustain successful native plant gardens. Native plants have been repeatedly planted and they have repeatedly failed. NAP has not “restored” the health of the urban forest. They remove trees in big groups as they expand their native plant gardens. They are not thinning trees. They are creating large openings for the grassland and dune scrub that they plant in the place of the urban forest. Every tree designated for removal by the NAP management plan is clearly selected for its proximity to native plants. It is disingenuous to suggest that NAP’s tree removal plans are intended to benefit the urban forest. Of all the fictions fabricated by native plant advocates to justify the destruction of our urban forest, the claim that its destruction will “prevent catastrophic fire” is the most ridiculous. The native ecology of California is highly flammable. Most fires in California are in native chaparral. According to San Francisco’s hazard mitigation plan, there has never been a wildfire in San Francisco[ii] and one is unlikely in the future because the climate is mild and moist. When it is hot in the interior, it is foggy in San Francisco. The hot winds that drive most fires in California never reach San Francisco because it is separated from the hot interior by the bay. San Francisco is surrounded by water, which moderates its climate and virtually eliminates the chances of wildfire. The tall non-native trees precipitate moisture from the summer fog, which moistens the forest floor and reduces the chances of ignition. In the unlikely event of a wind-driven fire, the trees provide the windbreak which would stop the advance of the fire. Webmaster: In addition to the 18,500 trees over 15 feet tall which NAP proposes to destroy, the NAP management plan also states its intention to destroy non-native trees less than 15 feet tall. In other words, the future of the forest will also be killed. The intention is to eliminate the urban forest in San Francisco’s parks over the long term. Yes, this will take some time, but the long-term intention to eliminate the forest is clear. Webmaster: We urge our readers to take NIC up on this offer to provide ”more clarification” of its spirited defense of the Natural Areas Program. Do you think NIC is deluded about there being only a “handful of people” that are critical of the Natural Areas Program? Did you notice that NIC does not acknowledge the use of herbicides by NAP? Do you think that a fair representation of criticism of NAP can omit this issue? If you visit a park that is a natural area, do you think NAP has demonstrated in the past 15 years what NIC claims it is accomplishing? Do you think NIC has accurately described recreational access restrictions in the natural areas? Do you think that San Francisco’s urban forest will be improved by the destruction of 18,500 mature trees and countless young trees? [ii] “The California Department of Forestry and Fire Protection (CAL FIRE) has no record of any wildfire in San Francisco.” San Francisco Hazard Mitigation Plan, 2008, page 5-18.